Discless | Lose the disc. I step out from the pale blue illumination of the Vortex portal and onto the sterile metal balcony overlooking the streets of Brooklyn, New York. In the mall entrance ahead of me, a mob of men wearing skateboarding safety gear frantically run back and forth, unsure of what to do with themselves. I push my way through them, walking down the white tiled ramp to the market terminals. I log into one, browsing the created items when a burst of gunfire suddenly erupts behind me. Everyone starts jumping and strafing, like popcorn kernels thrown into hot oil. They start firing blindly to try and defend themselves from this random attacker, leaving me riddled with bullets and energy weapon fire. Welcome to Face of Mankind. Just like the title of this MMORPG, the game itself seems so vague and obtuse that it’s almost impossible to accurately describe. The closest approximation I can make would be like someone trying to make a Deus Ex MMORPG. I know that sounds exciting, but it’s all based on one primary concept that might alienate a lot of players: everything is player-driven. All the organizations are run by players, all the items are player-made, and even the police force is run by players who actively try to capture criminal players. It’s a pretty high-concept idea, and one that depends entirely on a large and active player base. Due to this, you’ll probably be able to decide if Face of Mankind is a game you can get into or not within the first few minutes of playing it. It’s very easy to feel directionless. You’re pretty much thrown into the universe after a quick tutorial that explains the game mechanics for combat, resource mining, and item production. There are no classes, player levels, or restrictions on anyone. If your character dies, you’re revived in a cloning facility and lose one of your limited clone bodies, along with all of your unequipped items. If you run out of clone bodies and the credits to buy them, your character will be permanently dead. You pretty much have full access to everything in the game right off the bat. 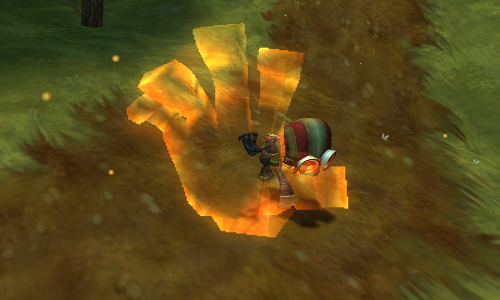 There are very few NPCs around and the few NPC quests available are shallow and provide little benefit. Most of them consist of talking to a NPC, walking across a hall to talk to another NPC, and then talking to the original NPC again. The best way to get started is usually to join one of the player factions, such as the Law Enforcement Department or a corporation. These organizations usually have support for new players and provide a steady income of credits. You aren’t tied to one faction forever and can switch between them every eight hours. If being a mining-focused corporate worker isn’t working out for you, then you can just pop over to the law enforcement faction and try to arrest criminals. Player leaders can set goals for the corporation. Face of Mankind is definitely banking on the idea that you’ll love the random experiences you can come across enough to forgive the tremendous lack of polish everywhere else. The character models are bland, the game world feels empty, and the environments feel like I’m playing a Half-Life mod, but for some reason I just find it interesting to play because of the experiences it offers. Once I started the game, I joined Vortex Inc., the company behind the instant travel teleporters players use to warp between planets and different areas. In the faction chat, one of the wealthy players started ranting against the current CEO, saying he was unfit for the job. The CEO, in standard faction drama action, revoked the complainer’s faction privileges and fired him from the corporation. 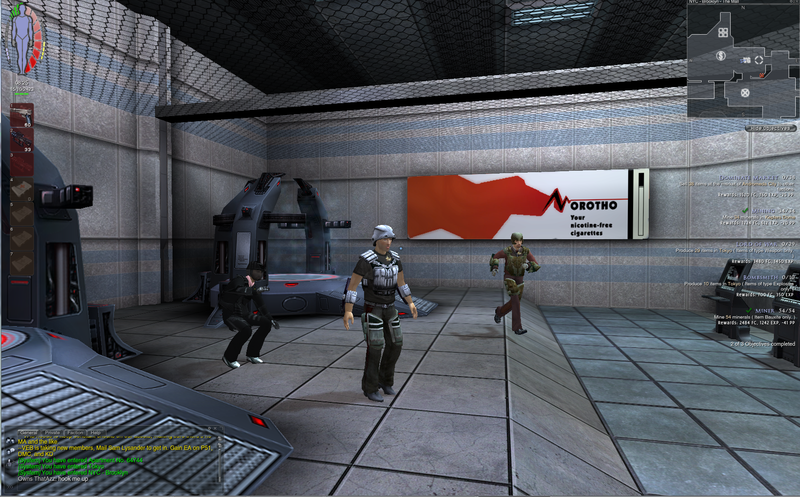 The fired player ended up spending cash to hire a mercenary faction to camp and kill Vortex Inc. employees around the Tokyo offices, resulting in the Vortex security forces and the mercenaries battling it out. After being killed in the skirmish, I checked a security panel and saw he had become one of the “Most Wanted” players, making him a priority target now for the Law Enforcement Department. The roleplay focus of the game means most of the player base have higher than average spelling and grammar skills compared to other online games. I was never really able to get into the whole roleplaying thing myself, but if that’s your cup of tea then you should probably consider checking it out. It’s very common for new or bored players to suddenly start firing their weapons in populated areas. This makes the first loading zone, Brooklyn, probably one of the most dangerous to be in. You’re pretty much guaranteed to constantly hear gun fights going on between other players, or between criminals and the police. There is a decent amount of environments to explore, but most of them feel pretty empty. You really have to be able to make your own fun, or get creative with the players and setting to truly get into it. There’s a lot of potential for greatness here, but I’ll be amazed if this game goes anywhere beyond the small niche player-base it already has. The design puts a lot of the burden of responsibility on the shoulders of the players to create virtually all of their own content. If there aren’t dedicated players willing to create their own corporate and political intrigue, then there is literally nothing to do in the game. The gameplay mechanics feel too clunky and stiff for FPS fans to get into it and the lack of a solid structured environment for new players gives it a steep learning curve. It’s pretty much the only game of its kind out right now, and free to play. I would highly recommend everyone give it a shot to explore to the different ideas at work here, but don’t go in with high expectations. I’ve always had a special attachment to the horror genre. My parents divorced when I was a little kid, so I only really saw my father during summers and holidays. He was a big horror movie fan, and we would marathon scary movies together every time I visited. I guess I’ve always associated horror media with those father-son kind of moments, and I’ve held a love for the genre ever since. Since I also grew up playing video games, this fondness naturally extended to the survival horror genre. The problem is, I can’t help but feel that the survival horror genre has lost sight of itself over the past few years. It seems harder and harder to find survival horror games that don’t focus on lighting up zombies with gold-plated AK-47s. The mainstays of the genre, like Resident Evil and Silent Hill, are the most noticeable examples of this shift that has transformed survival horror into survival action. The shift really began once Resident Evil 4 hit the market to critical and commercial acclaim. It was definitely a great game, and it was refreshing to play a Resident Evil game that was willing to try something new with its gameplay mechanics and setting. It did so well that other series in the survival horror genre sought to imitate it, especially the tighter focus on action-oriented gameplay. The actual horror elements of the genre ended up becoming less of a focus, while aspects like enemy combat and action set-pieces were given the spotlight. 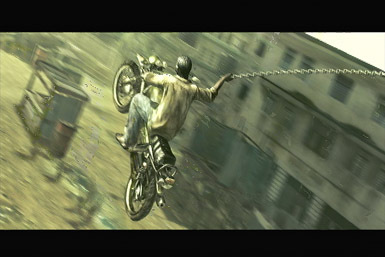 Capcom followed this up with Resident Evil 5, a game that featured quicktime events against motorcycle-riding infected people and a boss fight that pitted a Humvee’s mounted turret against a giant bipedal monster. I know not everyone is scared of the same things, but does anyone really find these things horrifying? Are these games marketed toward some kind of demographic that can’t sit through Die Hard without shitting its pants? I know the first few Resident Evil games had their flaws, but it was obvious that a large part of the game’s design focused on setting up a decent horror-themed environment. The first Resident Evil mansion had a well-established horror atmosphere, where zombies trapped outside pounded lethargically against windows. The locations were appropriately dark and dangerous, adding to the player’s discomfort at being forced to navigate through them to escape. Resident Evil may have started the trend, but the worst culprit is arguably the Silent Hill series. This could be mainly due to Team Silent no longer developing the current Silent Hill games, but I think my point still stands. The series was initially praised for its focus on psychological character-driven stories. The characters were people with deep personal flaws that the cursed town exploited to create monsters. The emphasis in the design was clearly placed on exploring these character’s back-stories and their attempt to escape from the haunting fog-covered town. Combat existed, but you weren’t actively encouraged to fight against the monsters. 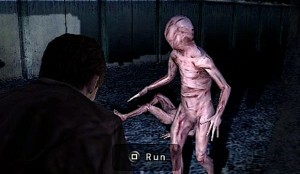 Once Silent Hill: Homecoming hit the scene, combat became the main focus, exemplified by the main character’s dodge rolls and melee combos. The popular monsters from Silent Hill 2 lost their contextual meaning and became generic monsters to be encountered, a hollow attempt to capitalize on the marketability and popularity of the creature designs. The famous Pyramid Head creature is probably the most notable example of this: In Silent Hill 2, the creature represented the main character’s feelings of guilt and desire for punishment. Now, Pyramid Head kind of just shows up to wink at the camera. The Silent Hill 1 re-imagining, Silent Hill: Shattered Memories, went back toward the psychological horror setting by trying a unique mechanic that would alter the game based on various psychological tests given to the player. However, Shattered Memories was treated more like a spin-off to the main series and was only released on the Wii, PlayStation 2 and PlayStation Portable. It never met the kind of commercial success needed for the Silent Hill series’ creators to reconsider the merits of psychological horror focused gameplay. “Horror” games that make horror the main focus of the experience feel like they’re becoming few and far between. Amnesia: The Dark Descent, for example, was praised for its immersive atmosphere and setting. There were no cheap jump scares and no combat mechanics. The player is actively encouraged to run away from any monsters they encounter. You can’t even look at them without starting to lose your sanity, keeping all of the monster’s features a mystery. To me, that’s what horror is all about at its core: the fear of the unknown. It’s about the nervous and unsettling feeling you get when you’re walking home late at night by yourself. It’s why you’d have a hard time trying to find someone that would want to explore an abandoned hospital with you at night, even though you know nothing is really going to be waiting for you there. It’s about feeling vulnerable to something you don’t quite understand and is threatening to you. The feeling of fear and horror is somewhat diminished when the majority of a game is spent blowing away dozens of expendable monsters. These kinds of feelings are what the survival horror genre should try to evoke in the player. For example, take a look at Clock Tower for the SNES and PlayStation. 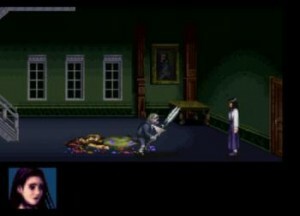 (Clock Tower was never released in any English-speaking countries, but was translated by fans of the game.) In Clock Tower, you play as Jennifer, a young girl who has been adopted with three of her friends by a wealthy family that isn’t quite what it seems. The atmosphere is built up by long periods of silence and methodical movement. This is used to contrast the horror of encountering the Scissorman, an invincible serial killer that stalks Jennifer throughout the mansion. These chase scenes are intense, giving you a real feeling of urgency to escape when the music suddenly ramps up and this killer is chasing you. There is no Magnum to grab and blow his head off with – you’re expected to either outrun him or hide until he gives up and goes to look for you somewhere else. You’re repeatedly forced to try to survive as you solve the mystery of the family’s history. I hope the horror aspect of the genre will be given more attention as time goes on. With the greater focus on setting up firefights and brawls with monsters, however, a large part of what makes survival horror unique is lost. There’s plenty of other game genres you can go to if you’re looking for straight-up action, but not if you’re looking to be scared. For now, it looks like the prominent series in the genre are going to keep moving toward their new focus on action-oriented gameplay. The recently released spin-off Resident Evil: Raccoon City Operations has gone all-out action, becoming a cooperative cover-based shooter. Trailers and details of Resident Evil 6 suggest that Capcom is trying to find the best of both worlds by featuring multiple characters, each with his or her own perspective. One side will be the action-oriented soldier scenario and the other will be the more methodical and atmospheric approach. I truly believe horror games have a huge potential they haven’t realized yet. A large part of the horror genre is based on exploiting psychological fears, and the horror genre has the potential to explore symbolism and psychosis in ways that other genres don’t usually touch. Hopefully, the horror elements of the genre will regain their prominence in the future, because without it, we would end up with a genre that only differs from action shooters because you’re shooting monsters instead of soldiers. Honestly, we’re pretty much already there, so unless things change, we can all look forward to the inevitable Resident Evil 15: Rocket Launcher Outbreak. 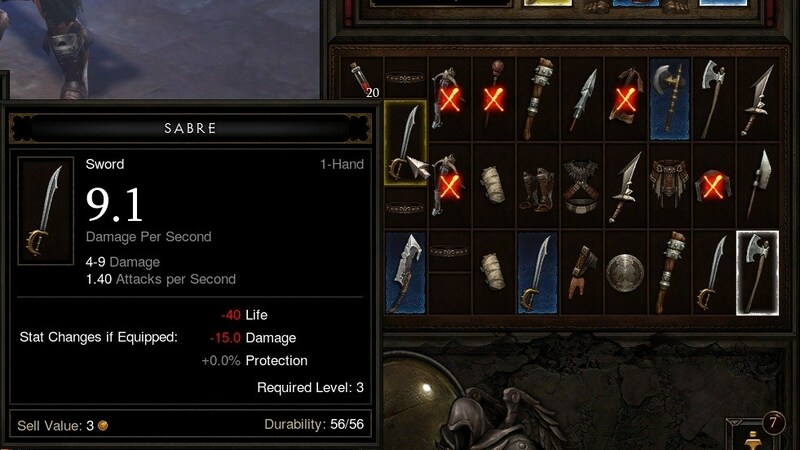 This starter guide for Diablo III provides some tips and suggestions for players who are new to the game, and also answers some of the most common frequently asked questions regarding its basic systems and mechanics. This is not an in-depth guide for advanced players and does not comment on any subjective debates like which class is best. It is intended to be a basic introduction to help players who are just beginning the game and want to know some of the most important information to get started. 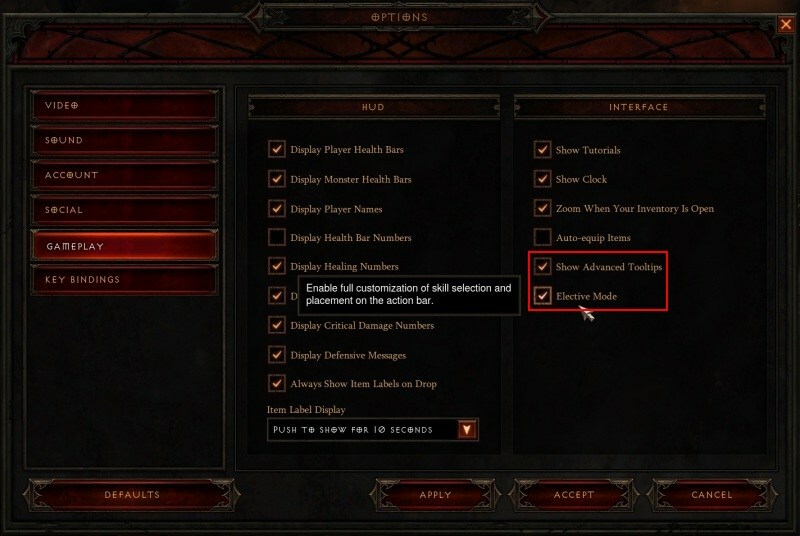 The most important suggestion for new players is to turn on Show Advanced Tooltips and Elective Mode in the Game Options. 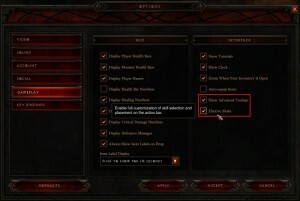 In fact, this should probably be the first thing you do after logging into Diablo III with your Battle.net account. These options can be found here: Game Menu (Esc) > Options > Gameplay > Interface. Advanced Tooltips and Elective Mode are both practically essential. 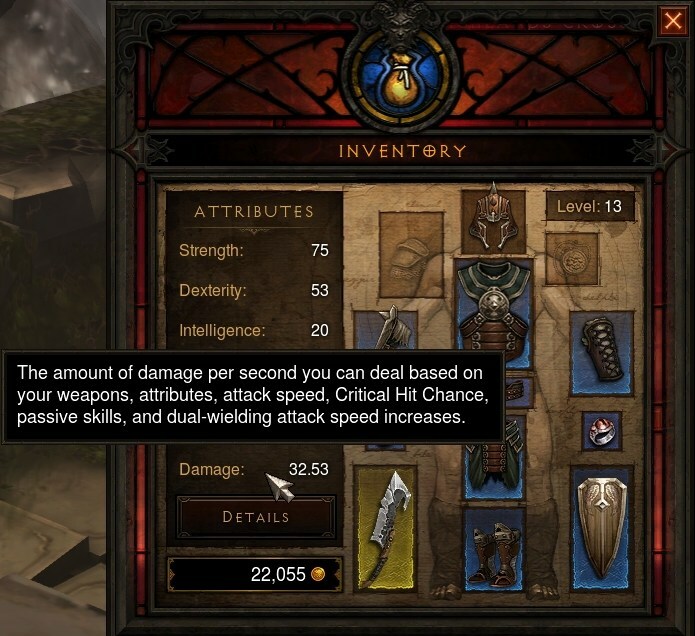 Advanced Tooltips shows you more detailed descriptions of skills, as well as the actual numbers and data associated with them. This is obviously useful because it removes some of the guesswork when comparing skills to each other. Elective Mode allows you to map skills from any category to any of your hotkeys, which is useful if you want to equip more than one skill from the same category. The second-most important suggestion is to bind the Move command to a key (Game Menu > Options > Key Bindings > Gameplay). This command is not bound by default, and it will make your character move to your cursor without attacking. This is especially useful for melee classes, in case you ever need to stop attacking some pesky enemies and run around them to grab some health orbs. Bind it to whatever works best for you. I used the middle mouse button (Mouse3). With the two big suggestions out of the way, here are the most frequently asked basic questions I could think to answer. Can I play Diablo III without an internet connection? No. You need to be logged in to Battle.net to play, even if you’re playing by yourself. Can I give my friend a Guest Pass key and play with him? Why did my map progress reset to undiscovered? The map is randomly generated every time a new game session is started. What is my damage per second (DPS)? Open your inventory (default bindings are I and C). 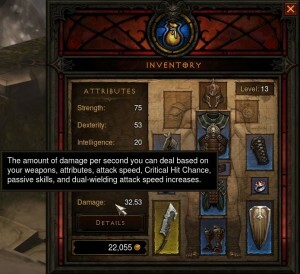 The Damage attribute on the left side of the inventory screen is your DPS, calculated based on several statistics. Damage per second is calculated from several other statistics. How do I attack without moving? Use the Force Stand Still command, which is bound to Shift by default. In other words, hold down Shift and click an attack button to perform the attack without moving. How do I retrain my followers? First, hire the follower you wish to retrain if you haven’t already. 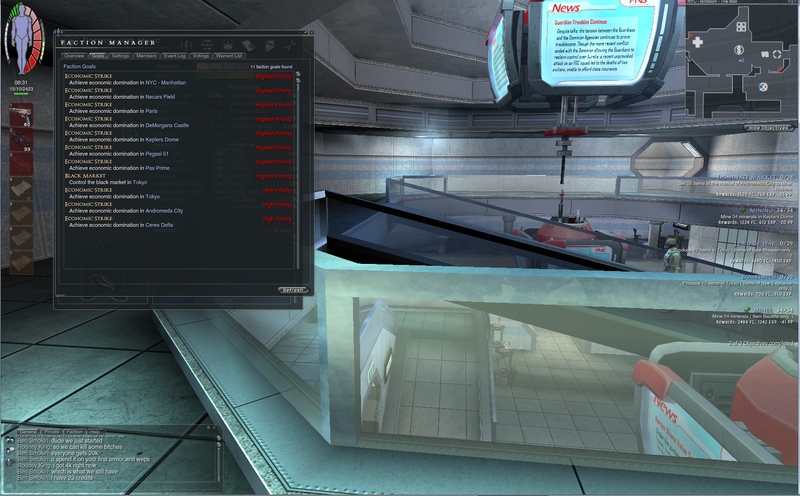 Then right-click your follower’s portrait (in the top-left of the screen) and select Retrain. How do I give gold to another player? You must initiate a trade with the other player. Right-click the player’s portrait and select Trade. There is no way to drop gold on the ground. How do I repair my damaged equipment? You can repair your items at any of the merchants in town. You can’t repair your gear at the Blacksmith artisan. Should I pick up white and gray items? Short answer: No. Longer answer: White and gray items have such poor sell values that it does not seem worth the time and effort to even pick them up to sell to the vendors. Plus, they can’t be salvaged for crafting materials. Your inventory space would be put to much better use storing magical, rare and (hopefully) legendary finds. Total selling price for all the whites and grays in this screenshot? 71 gold. Please note, however, that potions, gems and crafting pages appear as white items. You definitely want to grab the gems and crafting pages. Is there a faster way to drop items on the ground? Not that I’m aware of, unfortunately. The only way to drop items is to click the item in the inventory and then click the ground or click and drag the item out of the inventory, both of which are tedious when trying to dump trash. How do I link items in chat? Open the inventory screen (default keys I and C). Press Enter to open the chat window. Hold Shift and left-click on an item to add it to your chat line. When will I start finding gems? Can I reclaim gems that have been socketed into armor and weapons? Once you have the Jeweler artisan, you can remove gems from socketed gear by using the corresponding tab in the artisan’s crafting window. The gems will be returned to your inventory. You can also salvage the socketed items at the Blacksmith artisan if you no longer want the armor or weapon the gem is affixed to. The gems will be returned to your inventory in this case as well. The only way to lose a gem permanently is to sell the socketed item with the gem inside it. I heard that giving the Templar follower a shield will break my game. Is this true? This bug has been fixed. You don’t need to worry about it anymore. How do I see my frames per second (FPS)? The default key binding to show your FPS is Ctrl+R. 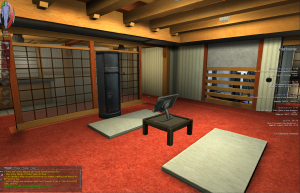 The FPS counter appears in the top-left corner of your screen. No external program necessary! Why do I suddenly not hear anything? You might have accidentally turned music or sounds off. Try the Toggle Music (Ctrl+M) and Toggle Sound (Ctrl+S) commands to turn them back on. Additionally, you can conveniently shift the master volume up and down in increments of 10% with Ctrl+Equals and Ctrl+Minus, respectively. Can I access the Auction House while in a game? No. The Auction House can only be accessed from the campaign screen, before entering a game. If you are in a game, you will have to leave it to access the Auction House. Can I appear offline or invisible on Battle.net while playing? No. Currently, there does not seem to be a way to do this. How do I prevent people from joining my game? Turn off Allow Quick Join in the options (found at Game Menu > Options > Social > Friends and Chat). This will prevent your friends from joining your game without a confirmation. PrintScreen, of course! Also known as the SysReq key. This key binding can be changed in the options. Talk to the mentally-projected hand. The last time I tried to play Psychonauts, I was immensely frustrated in the first few seconds. Not by the content of the game, mind you, but by the fact that it wasn’t recognizing the 360 controller plugged into my PC. I had heard horror stories about certain platforming sections and that playing with a mouse and keyboard was a fool’s errand, so this would not stand! That moment of excited anticipation for a game by developers I love faded pretty quickly. By the time I closed out of the program to find a method to get the controller to play nicely, distraction had already placed its icy grip firmly on my shoulder. Years passed, but that never stopped the flow of positive things said about Psychonauts, whether it was referenced for its great sense of humor or cited as a depressing example of a good game selling poorly. Double Fine Productions is a fantastic studio and they’ve made some great products in the past couple of years. I spent a good chunk of time blowing up Tubes with a buddy in Iron Brigade (back when it was known as Trenched), and Costume Quest was very adept at delivering some killer wisecracks. Even Brutal Legend, a divisive game amongst many reviewers, is something that I still recommend that people try out despite its shortcomings. Its ambitious design makes it one of the most unique games I’ve ever played. 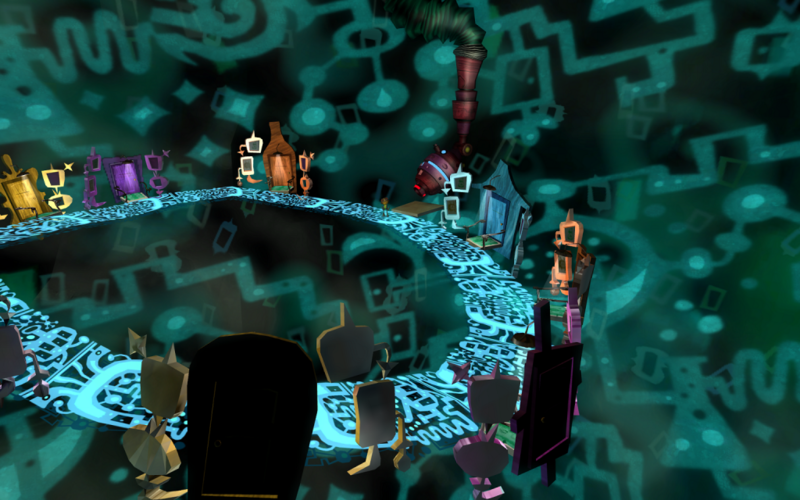 A few months ago, a patch came out for six-year-old Psychonauts. This was a result of the original publishing deal with Majesco expiring, which reverted the rights back to the developers at Double Fine. The patch was a whopper, adding in Steamworks support such as cloud saving and achievements, tweaking the difficulty of some levels, and putting out a Mac version of the game to boot. My interest in the game was full of renewed optimism, as I inquired to myself, “If they did all of that, then maybe, just maybe, they added in native 360 pad support!” Of course, when I put my mind to something, it will still take me several months to actually do it. Luckily, the dry spell of games this month proved to be the perfect condition to finally sit down and give Psychonauts the good old college try. Again. Before a title screen even has the chance to come up, the game prompts you to pick a save slot. I was immediately overwhelmed by a sense of relief as my 360 controller was registering without even having to configure it. One caveat to this, however, is the fact that any action the game advised me to perform was instructed with on-screen images of keyboard prompts, not gamepad button prompts. They clearly have gamepad button graphics in the key binding options menu, so it’s not for a lack of those. After hunting around in the options for a while, I wasn’t able to find a way to fix the issue. An annoying oversight, but I’ll happily take it over some third-party workaround just to get the controller working. Now that we have a working controller, let’s journey onward to the meat of the game. And no, I don’t specifically mean the Meat Circus. The Collective Unconscious of your mind is one of several surreal environments. Psychonauts starts you off as Raz, one of many children sent to a summer-turned-boot camp to train to become what can only be assumed as some sort of psychic soldier. It’s your run-of-the-mill 3D platformer with a reasonable control scheme and areas full of collectible goodies. That said, it doesn’t take a psychic to see why it’s so heavily praised. The wonderfully cartoony design approach meshes well with the levity that surrounds everything you come across. You can barely go two minutes without hearing talented voicework from the cast of characters, which is as colorful as the game’s art. The narrative does a great job of putting the player in the world by maintaining a fantastic pace for the story. Overall, everything feels deliberately cohesive, and even if 3D platformers aren’t your preference (they’re definitely not my favorite thing to play), it’s easy to find yourself hungry for more. The latest PC patch offers a bit of incentive to revisit the game for those who have already played through it, with Steam achievements for those who like to show off. The native gamepad support and Mac version help make it more accessible to people like myself who missed this beauty the first time around, though it is a slight chore to deal with on-screen keyboard prompts when you’re using a controller. However, jumping over that hurdle is more than worth it, since Psychonauts is already leaps ahead of almost every other 3D platformer I’ve ever played. I’m only a few hours in, and that’s all it took for it to me to realize that I need to see it through to the end. It’s a shame that it originally sold as poorly as it did; critical acclaim surrounded Double Fine’s first major release left and right, but less than 100,000 copies had moved in the first eight months. Luckily, this hasn’t shaken Double Fine founder Tim Schafer, who told CVG back in late 2010 that he wouldn’t be opposed to making a sequel. According to Shafer, the main sticking point is finding a publisher who is interested in putting it out. Psychonauts has recieved a plethora of positive commentary over the years, so the name is in enough people’s heads to potentially be a big seller. With any luck, this article may just put it in a few more, so if you haven’t had the chance to pick it up yet, put on your thinking cap and grab it as soon as possible. 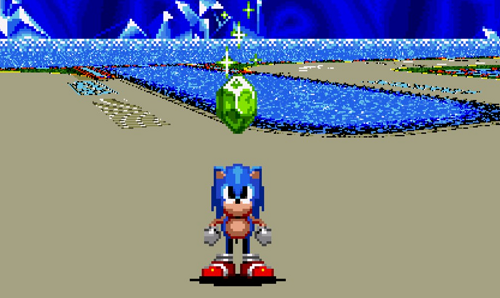 Sonic awaits his just deserts. 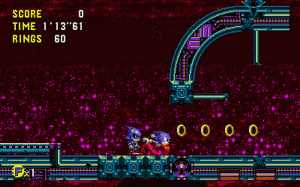 Sonic CD is my least favorite of the Genesis-era 2D Sonic games. I always preferred the speedier pace and flow of Sonic the Hedgehog 2, 3 and Knuckles, as well as the relatively muted, warmer color palettes of those games. 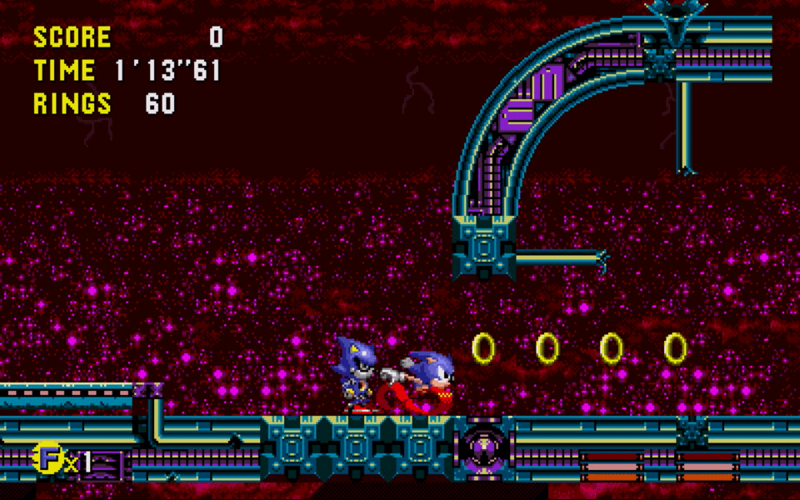 The denser and chaotic design of Sonic CD‘s zones demands more precise platforming prowess that at times results in a ponderously paced game, at least when compared to the canon entries of the series. Despite this, the recent re-release of Sonic CD (on PSN, XBLA, Steam, iOS, Android, and Windows Phone) is the most fun I’ve had with the speedy spinster since the Dreamcast, though this isn’t the first time I’ve played Sonic CD legally and officially on a computer. 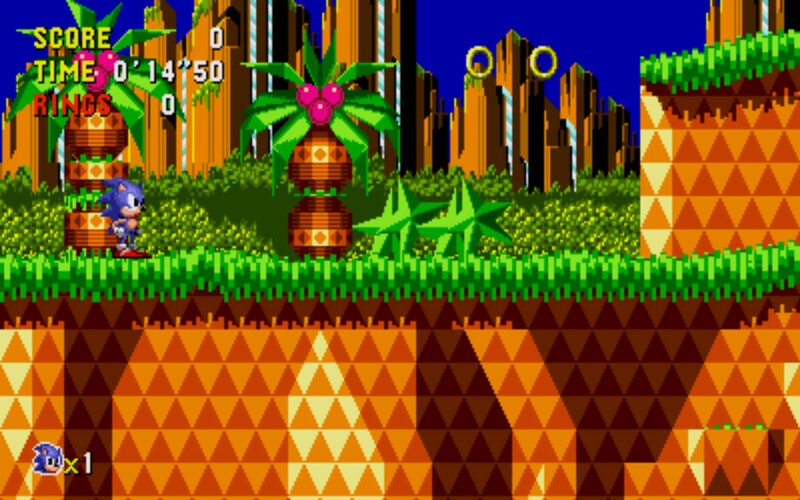 It was originally ported to Windows in 1996, and was Sonic’s official debut on the home computer. (This was a big deal at a time before the poor blue bugger had been prostituted out to practically every device and platform with a microprocessor inside it.) I recall my brother and I buying the 1996 CD-ROM game with some hard-earned allowance money at an Office Depot during one of our mother’s regular business-related trips to the store. It was probably both the first and last time I was ever excited to go to that depressing place. Oh, chibi Sonic, you’re so cute! I had never played the game before the first PC version, since we didn’t have a Sega CD. While I never did grow to like Sonic CD as much as the other Sonic games I’d played on the Genesis – which is not very unexpected considering the combined Sonic 3 & Knuckles is easily one of my favorite platformers ever – I never regretted buying Sonic CD for Windows, and the game’s box probably still lives in a bigger box full of other fellow game boxes somewhere in my parents’ garage. I loved the soundtrack – the American version, as I wasn’t even aware of the Japanese version until years later – but I did not like the static spin dash that couldn’t be “charged up” by mashing on the jump button. (My dad’s computer’s poor space bar took the abuse for this game and many others.) 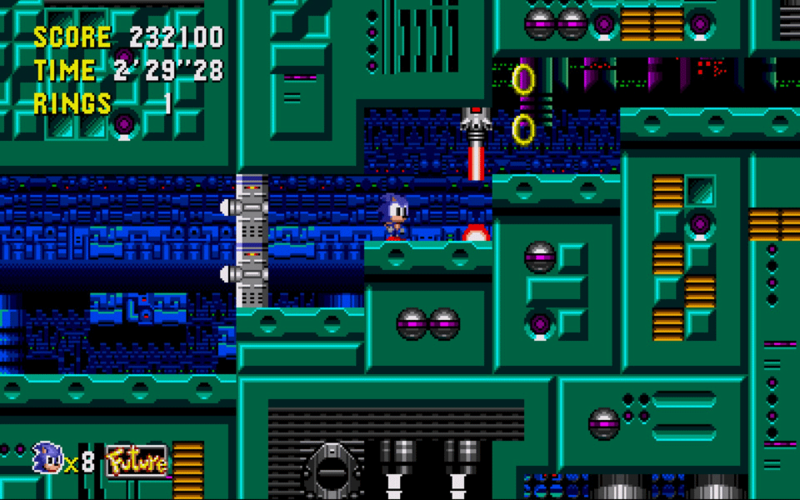 I also didn’t like the conceptually cool but mechanically cumbersome time-traveling mechanic, and I disliked the “three-dimensional” special stages, which paled next to those found in Sonic 2 and 3. 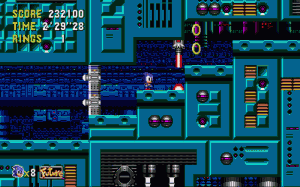 I don’t remember if I ever did obtain all the Time Stones or all the Robotnik machines in the past timeline, although I distinctly remember finding the animated FMVs for the intro and both endings on the disc and watching them repeatedly. In the years since, I haven’t given Sonic CD much thought after it was eventually uninstalled, or lost in an OS reinstall, or whatever its fate ended up being. So kind of Sega, then, to re-re-release this game on almost every modern platform imaginable and to lurch it suddenly to the forefront of my adolescent gaming memories. Sega’s ports of other classic games have thus far been disappointing affairs mired in ugly menu presentation and shabby emulation. (Of the Genesis? Today? Really?) How fortunate it is that Sega allowed the multi-talented Australian bloke Christian Whitehead to craft this adoring love letter to this rough gem of a game. As I said at the beginning of this post, Sonic CD is my least favorite of the Genesis 2D Sonic games, and easily at that. The level design is very busy and ofttimes downright contradictory to speedy gameplay. Indeed, bothering to hunt down Dr. Robotnik’s Marvelous MacGuffins is an exercise in annoyance that slows the game down even more. The time traveling mechanic, while interesting in concept, only serves to hinder you further, and there’s really no reason to visit the future aside from curiosity. Collecting the Time Stones, the other method for attaining the “good ending,” is comparatively frustrating as the special stages can become quite difficult both to enter and clear. Either way you decide to approach it, getting the good ending will likely require quite a bit of save scumming, since beating the game does not allow you to revisit old stages to rescue the future on your save file. While the game itself might be somewhat rough around the edges, Mr. Whitehead’s love letter is anything but. The menus are super slick, multiple save files are supported, and the Steam version runs in almost any resolution you could desire, windowed or full-screen (though you do have to awkwardly launch an external tool to change these options). There are three different settings for filtering the graphics, two of which are provided in case you’re a philistine and happen to hate pixels. The “sharp” and “smooth” options both look like warm vomit expelled directly onto your monitor at such a velocity that its blurry splotches spatter across your face. “Nostalgia” proudly flaunts its serrated corners and is the selection of true scholars and gentlemen (and gentlewomen), and if you choose anything else you are literally worse than a serial murderer. This option is stupidly not set by default, so make sure and switch to “nostalgia” immediately. I’ve included full-size screenshots below so you can see the difference between the three modes for yourself. 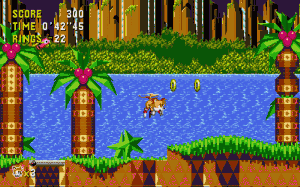 On top of running and feeling like a modern PC game, Mr. Whitehead deemed it worthwhile to add Tails as a playable character, only available after beating the game once as Sonic. 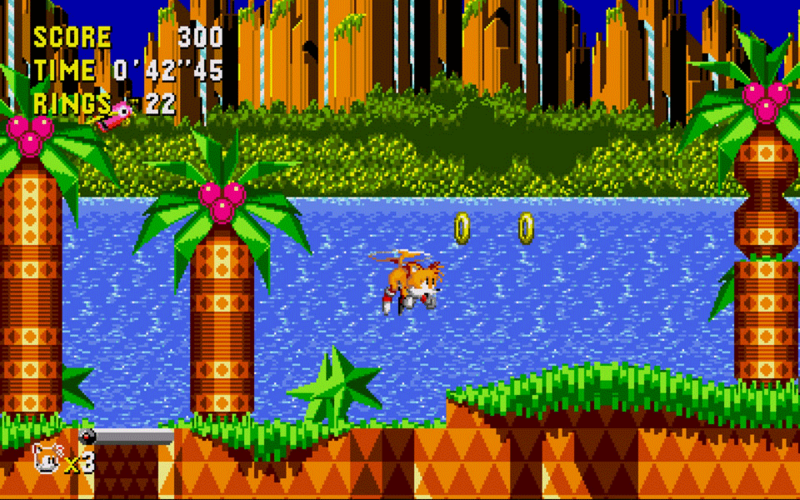 You can also change to the Sonic 2 style of spin-dashing and mash buttons to your heart’s content. Brilliant! In spite of these excellent additions, possibly the best part is that Sega was amazingly able to work out whatever licensing issues were required to include both the Japanese and American soundtracks in this release, which you can switch between at any time on the main menu. (It should be noted that they weren’t able to work out every single licensing issue, which means that the Japanese vocal songs are remixed sans lyrics. No toot tooting for this Sonic warrior, sadly.) I played through the game with the Japanese soundtrack for the first time and definitely enjoyed the experience. The Japanese soundtrack feels more thematically cohesive, since the songs for the past timeline were composed specifically for the Japanese soundtrack and weren’t replaced in the American version. That said, I do like both versions of the soundtrack about equally. That’s gross, Tails. Stop that. 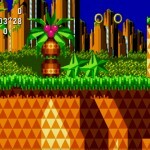 This release of Sonic CD is a revelation: the revelation that modern ports of classic games don’t have to merely settle for ROMs thrown slipshod into a subpar emulator, but can ascend – nay, soar – to loftier heights. The two versions I tried, Steam and iOS, both run fantastically and nothing is lost in the translation to either platform. I imagine the other versions glimmer similarly. At a paltry $5 on all platforms, Sega seems to be making all the right decisions with Sonic CD, and I hope they continue this trend with future games. This release is an essential experience not just for fans of the game or series, but also for anyone who’s played a 2D platformer and liked it.